How long can low interest rates last? While overall bank profitability in advanced economies (measured by return on assets) has recovered from the worst of the Global Crisis, it remains low. Many advanced-economy banks are facing profitability challenges related to low net interest margins (NIMs) – typically measured as net interest income divided by interest earning assets – as well as weak loan and non-interest income growth. And while NIMs across many advanced-economy banks have been trending down on a longer-term basis, they have fallen more sharply since the Crisis – in part, as appears so, due to lower interest rates. In many ways, of course, banks may benefit from low interest rates, both directly (e.g. through valuation gains on securities they hold) and indirectly (e.g. because non-performing loans will be lower as borrowers’ debt service will be less burdensome). On the narrower question of the effects of low interest rates on banks’ NIMs, though, analytics and existing empirical findings suggest that, controlling for other factors, NIMs are lower when interest rates are low. Low short-term interest rates can depress bank margins because for many types of deposits, banks are reluctant to lower interest rates. Since banks must pass on lower rates on assets based on contractual re-pricing terms (e.g. floating rate loans), and have an incentive to do so to those borrowers that have other financing choices (e.g. from corporate bond markets), bank margins compress as rates decline. Cross-country empirical evidence and studies support these negative effects. Analysing a sample of 108 relatively large international banks (many from Europe and Japan) and 16 from the US, Borio et al. (2015) document the negative effects of low interest rates (and shallow yield curves) on banks’ NIMs and profitability – with effects stronger at lower interest rates. Evidence for the US (e.g. Genay and Podjasek 2014) also finds this, although the direct effects of low rates are relatively small. Analysis for Germany (Busch and Memmel 2015) suggests normally small long-run effect of interest rate changes on NIMs, but large effects in the recent, low-interest rate environment. Evidence for other countries is scarcer to date. Figure 2 shows that average NIMs are higher in the high-rate environment (orange bars) than in the low-rate environment (blue bars). Profitability, measured by return on assets, is higher in the high-rate environment too, likely reflecting both higher NIMs and concurrent better overall economic and financial environments. To isolate the effects, we regress for all banks their NIM for each year on the average level of the three-month sovereign rate in that year – a common proxy for banks’ marginal funding costs – controlling for the bank’s own lagged NIM, other time-varying bank characteristics, and a bank fixed effect, as well as GDP growth and the spread between the three-month and ten-year sovereign rates. The sample is then split by banks in low and high interest-rate environments to analyse differences between the two rate environments. The baseline results show that a decrease in the short-term interest rate lowers NIMs in both a low-rate and a high-rate environment, with effects symmetric for an interest rate increase. But other things equal, the effects are statistically significantly larger in a low-rate environment. Figure 3 summarises the regression results. For a representative bank, a one percentage-point decrease in the short-term rate is associated with a nine basis-point decrease in NIM in the high-rate environment (orange bars) versus a 17 basis-point decrease in NIM in the low-rate environment (blue bars). Similar magnitudes and comparisons are found when using overall samples composed of different banks and countries.2 Even so, when conducting the analysis for individual countries, there is significant heterogeneity in effects. For example, a one percentage point decline in the three-month sovereign rate leads to a six basis-point decline in NIMs in Austria, compared to a 27 basis-point decrease in Italy. We also ran regressions analysing separately the effects of changes in interest rate on changes in interest expenses and on changes in interest income. The greater effect on NIMs in the low-rate environment is largely driven by the greater pass-through of low interest rates on interest income than on interest expense. Specifically, a one percentage point decrease in the short-term rate is associated with a 63 basis-point decrease in the ratio of interest income to earning assets in the low-rate environment, and only a 35 basis-point decrease in the high-rate environment, a 28 basis-point difference. The equivalent difference is about 20 basis points for the ratio of interest expense to liabilities. In other words, at low rates, banks have greater difficulty reducing their funding rates, while they have to pass the lower rates to a greater degree on to their borrowers, likely due to greater competition (including from non-bank lenders) and lower demand for loans (as economic activity is less in times of low interest rates), leading NIMs to decline more. We can summarise our results by considering the situations of banking systems in four key advanced foreign economies – the Eurozone, Canada, Japan, and the UK – and comparing these to US banks (see Table 1). Wide differences remain between the relatively strong profitability reported by Canadian, UK, and US banks and the weaker profitability reported by Eurozone and Japanese banks. These differences in profitability partially reflect differences in NIMs, which are typically lower in these countries than the US, as many of those banks have higher shares of typically lower-yielding mortgages and sovereign debt. And the lower NIMs in the later period in turn likely reflect the large declines in sovereign yields in these economies. 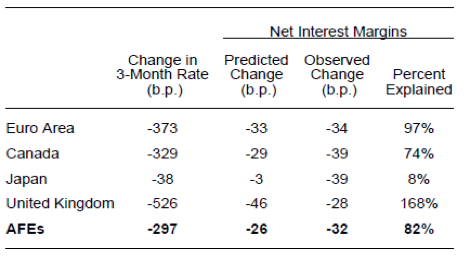 Our regression estimates suggest that the NIMs in these four banking systems declined by roughly 26 basis points due to the actual decreases in interest rates between 2007 and 2013 (see Table 2), or roughly 82% of the median decline in NIMs observed over this period, which was 32 basis points. These impacts range from three basis points for Japan and 46 basis points for the UK. If already in a low-rate environment, e.g. Japan and the Eurozone today, estimates suggest a NIM contraction of 17 basis points for every one percentage point further decline. There are caveats to this analysis, related to appropriate lags and potential other non-linearities between changes in interest rates and NIMs. First, there may be important non-linearities in the impact of interest rate changes in a low-yield environment compared to the high-yield environment not captured with our specification. Second, while we included one lag for the dependent variable, which was significant with a coefficient of about 0.5, there are likely additional lags in the relationship that are not captured (for example, as long-term loans are re-priced over time at higher or lower interest rates, affecting NIMs many years after an interest rate change). 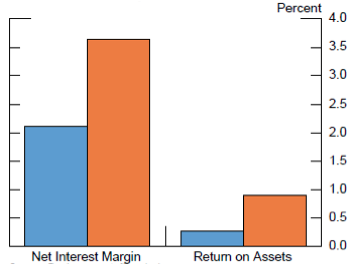 Third, the analysis only looks at the effect on current margins assuming no shifts in behaviour, while changes in interest rates and the full effect on banks’ NIMs (and profitability, capital adequacy and franchise values over time) may vary as banks adjust their funding structures, lending and investment portfolios, and their non-interest activities. Lastly, there have been many regulatory changes since the Financial Crisis that could also have affected banks’ NIMs, as has been found for large US banks (Covas et al. 2015). While there are these and other caveats to the analysis, our findings nevertheless strongly suggest that when NIMs are low, an important issue is how banks can adjust their activities and cost structures so as to offset adverse effects on profitability and capital. Although institutions are making adjustments, such efforts take time, with limited immediate payoffs when facing weak cyclical conditions and deleveraging pressures. As such, banking systems in many low interest-rate countries will face challenges. Until lost income can be offset through other actions, lower profitability will reduce financial institutions’ ability to build and attract capital, increasing their vulnerability to shocks and declines in market confidence, undermining their ability to support the real economy, and potentially weakening the transmission channel of monetary policy. Authors’ note: The views expressed in this column are those of the authors and should not be attributed to the Board of Governors of Federal Reserve System. Borio, C E V, L Gambacorta, and B Hofmann (2015), “The Influence of Monetary Policy on Bank Profitability”, BIS Working Paper No. 514. 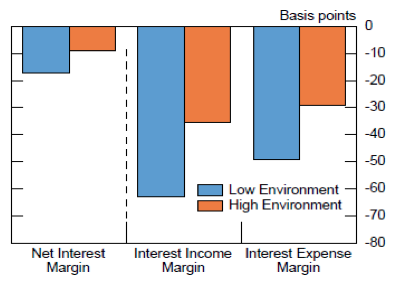 Busch, R, and C Memmel (2015), “Banks' net interest margin and the level of interest rates”, Discussion Papers 16/2015, Deutsche Bundesbank, Research Centre. Bundesbank (2015), Financial Stability Review. 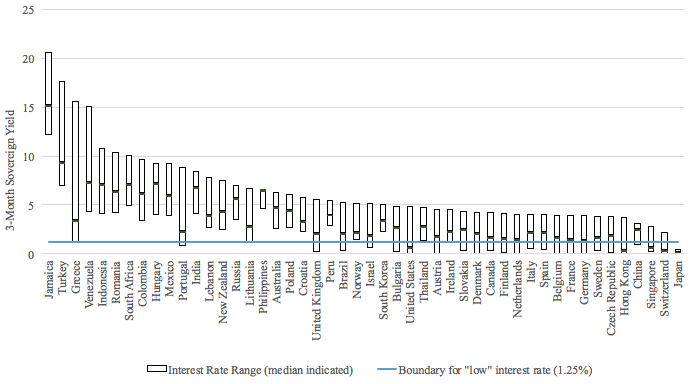 Claessens, S, N Coleman, and M Donnelly (2017), “Low-For-Long” Interest Rates and Banks' Interest Margins and Profitability: Cross-Country Evidence", CEPR Discussion Paper 11842. Covas, F B, M Rezende, and C M Vojtech (2015), “Why Are Net Interest Margins of Large Banks So Compressed?”, FEDS Notes, Federal Reserve Board, Washington, D.C..
ECB (2015), “Financial Stability Review”, Frankfurt. Genay, H, and R Podjasek (2014), “What is the impact of a low interest rate environment on bank profitability?”, Chicago Fed Letter, 324. Memmel, C (2011), “Banks’ exposure to interest rate risk, their earnings from term transformation, and the dynamics of the term structure,” Journal of Banking and Finance 35: 282–289. We control for banks’ balance sheets variables, but overall there do not appear to be major shifts in asset compositions or liability structures in low- versus high-rate environments that could be expected to drive differences in how net interest margins respond to interest rates. Results hold for unbalanced or balanced samples, samples with or without U.S. banks, and trimming observations differently.